So this week, with weather, tides, and wind finally cooperating, we finished redoing the membrane down our starboard side. The new membrane, lapped under the roof membrane, hanging out wrinkles. This one was a bit more complicated as we wanted to do some window work as well. In the Galley area, we had this big tuftex (corrugated greenhouse material) window along the whole Starboard side. It let in lots of light--a bit too much in fact in the mornings--and was kind of irritating since you can't really see out of it. So we decided to bite the bullet and do a replacement. Taking the tuftex out left a really huge opening. . .like, the whole wall. 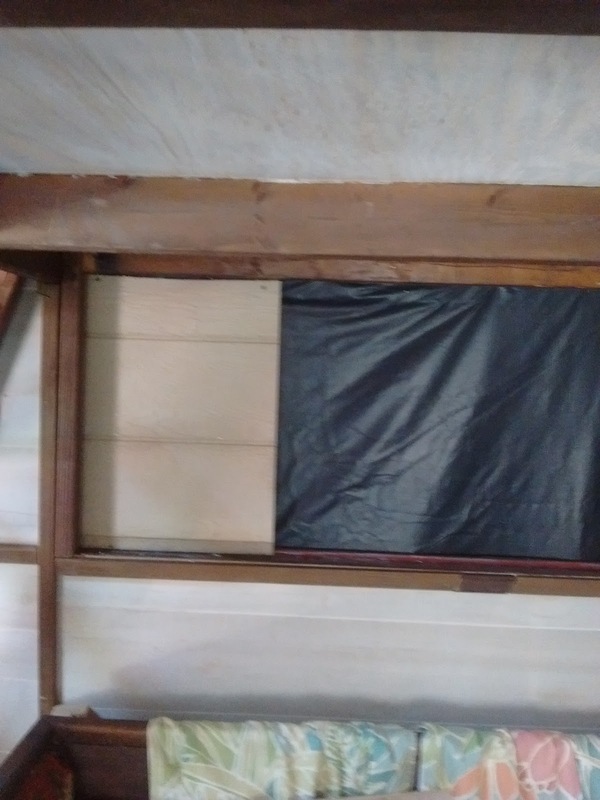 So after removing the window and stapling the new membrane in place on the outside, we began to do a fill in of the window space, using some exterior siding panels and adding another 3/4" of insulation. The black stuff below is the backside of the membrane. 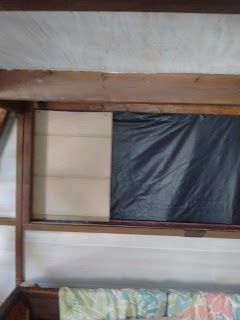 We slotted siding in in place of the window. 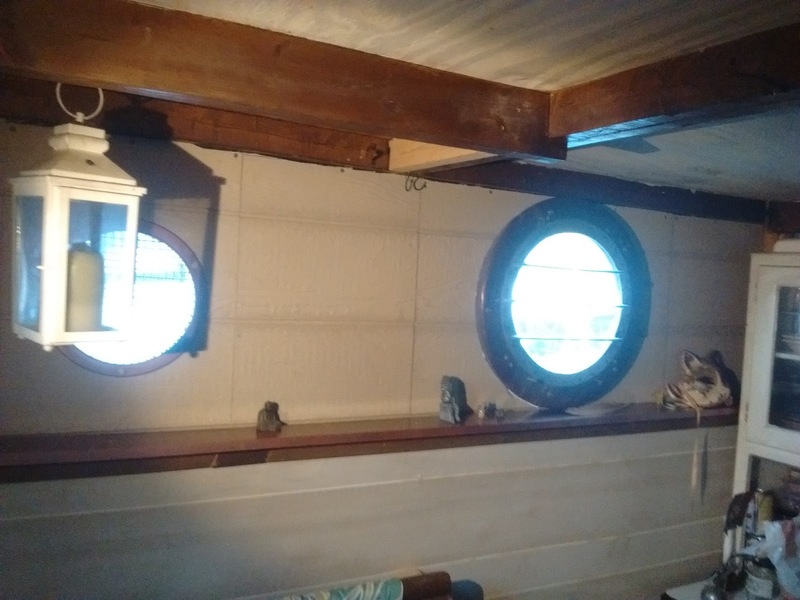 In the place of the huge window, we're adding two portholes, mostly made from found objects--a couple of old vent gratings and some lexan we had-- and painted hammered copper to give it kind of a steampunky look. The light is now a bit more controllable, plus we can actually SEE through them. 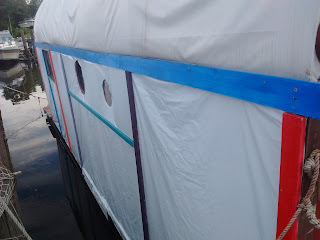 Then of course we had to do the battening on the exterior. You want a great core exercise? 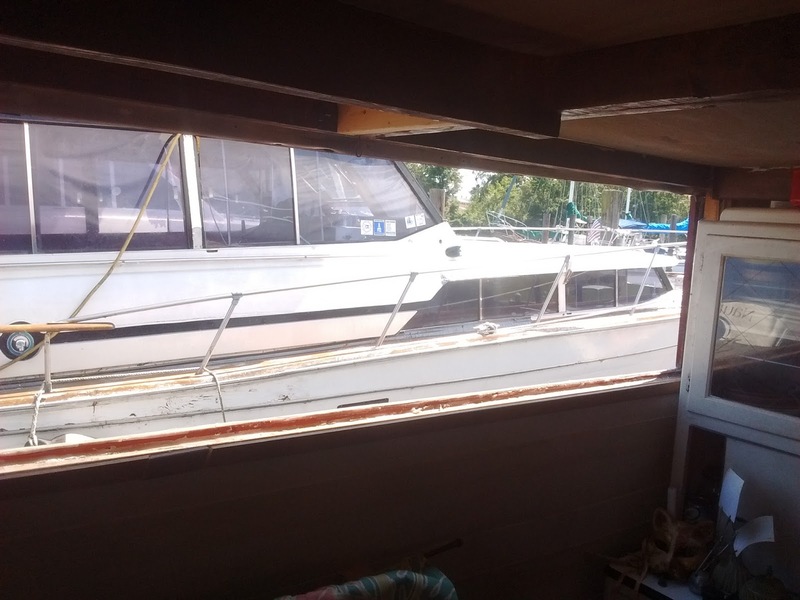 Try working over your head from a small boat on ANOTHER small, moving boat. Trust me. . . .
Battening going in...Yeah, I'm gonna feel this tomorrow. So inside we added a little decorative shelf (also hammered copper) and some trim molding. 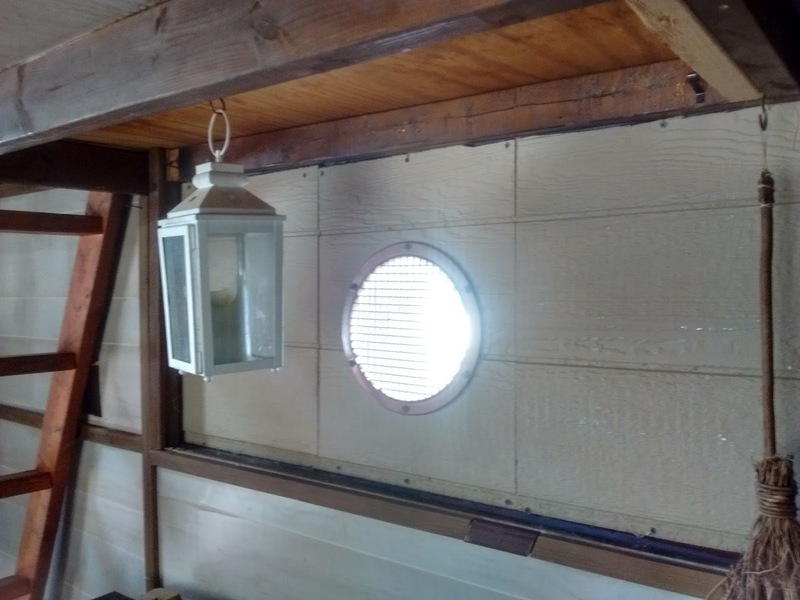 I think it's a nice addition, and will make us quite a bit warmer this winter. Oh, this worked out nicely. 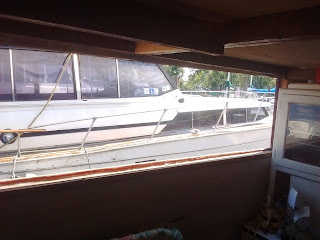 So now I've got to reset the tile beneath the woodstove and do a bit of additions to our floatation and we'll be set. Hey, some more book sales at Wildshore Press, check em out. That looks great! Thanks for sharing your changes due to experience. 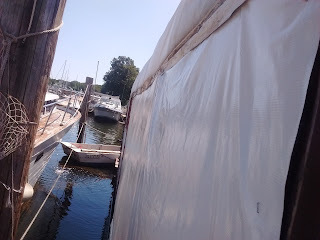 Yep, I'm thinking we'll be a good deal cozier this winter, not that last year was that much of a problem, but the revisions we've made will solve a lot of our minor irritations.